This morning I was very tired so we had a much needed quiet morning, and then after lunch headed out to find the Parc de la Ciutadella. A young Antoni Gaudi helped to design the very flamboyant Cascade Fountain which turns out to be the main attraction of the park. 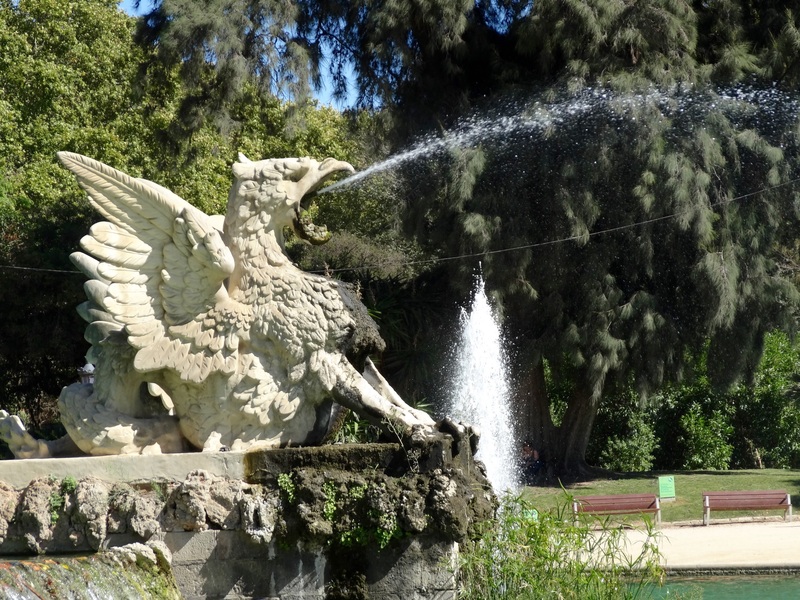 This Baroque fountain is very impressive and has winged golden horses with serpent tails rearing over the waterfall. My camera is acting up, not always focusing, taking weird pictures on one of the settings. I am wondering if I will need to buy a new camera before the trip is over? 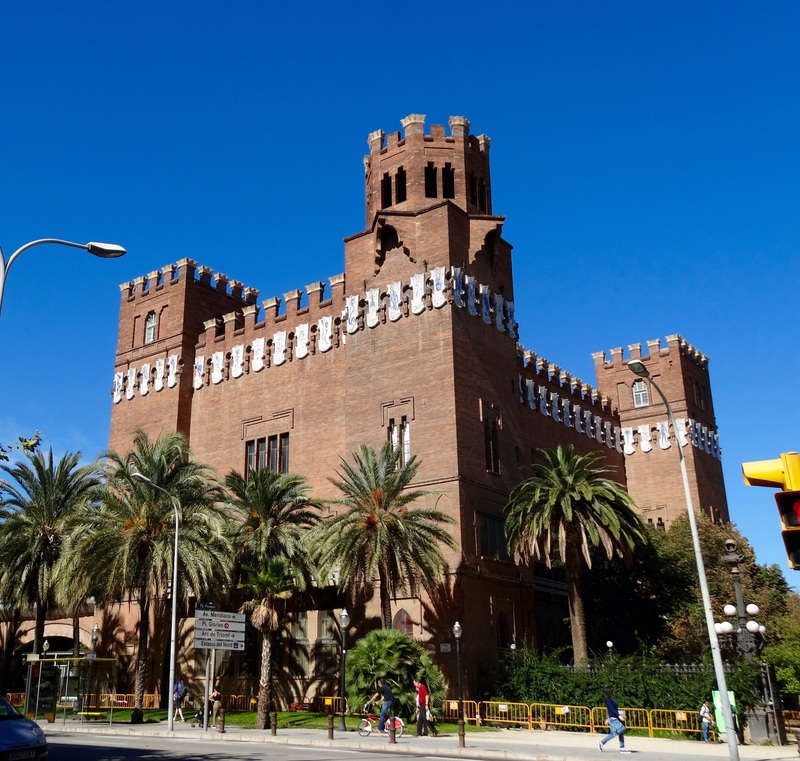 This is the Castell dels Tres Dragons, which is now a Natural Science Museum but it was roped off and not open. Neither was the Hivernacle and Umbracle (a wooden slatted greenhouse) and the other Natural Science Museum. That was a bit of a disappointment, but it was a nice walk around the park anyways. 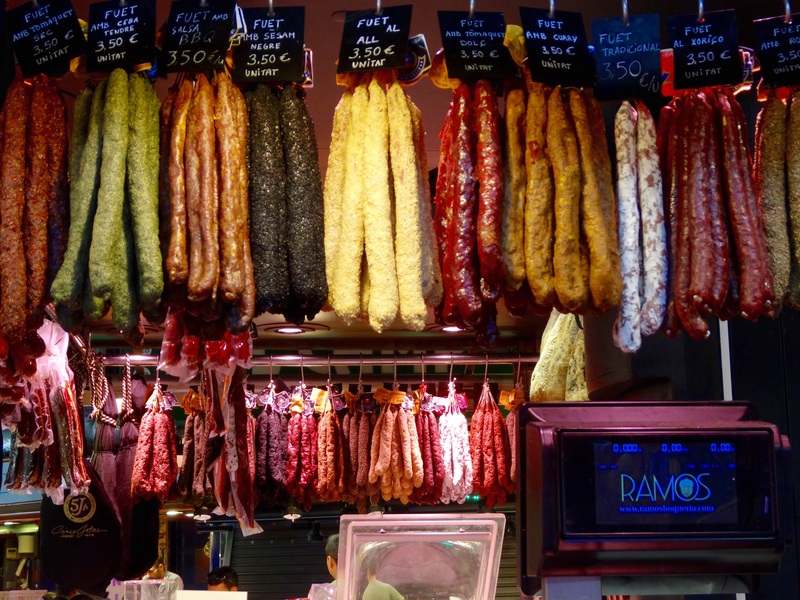 We head back towards the Old Town to check out the Merkat de La Boqueria near La Rambla. 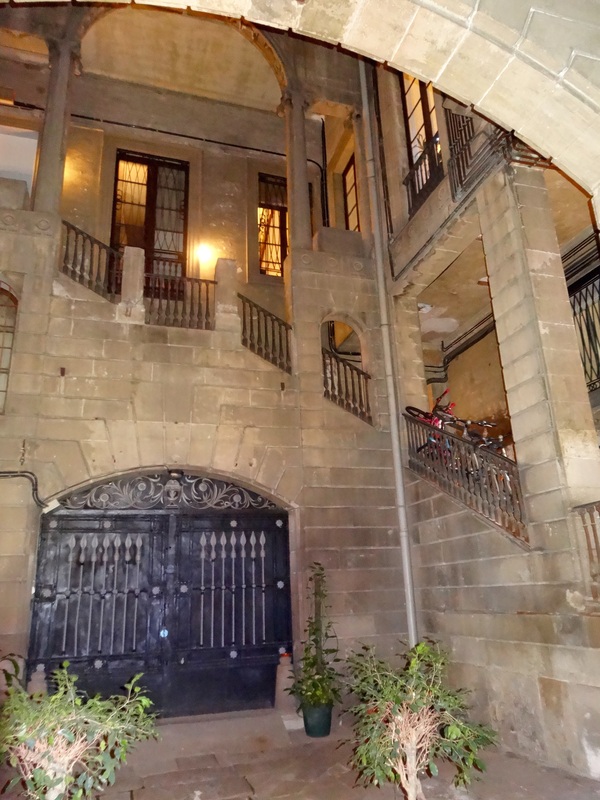 We walked down La Rambla last night, this is the famous Barcelona street, comparable to The Champs-Élysées in Pars, with hordes of tourists, and the Merkat (don’t you love the spelling?) was just closing. We came back to check it out today. We look for somewhere to eat but it isn’t easy for me. I have dietary restrictions so no gluten, dairy, egg or soy, which is in pretty much every Spanish dish! Finally found a Wok While you Walk which made a stir fry that I could have. There would be lots to eat if I didn’t have these restrictions and it is a bit hard passing all the pastry shops, they look so very yummy. These sausages looked very interesting, and the meats were very fresh and nice looking but also very expensive. 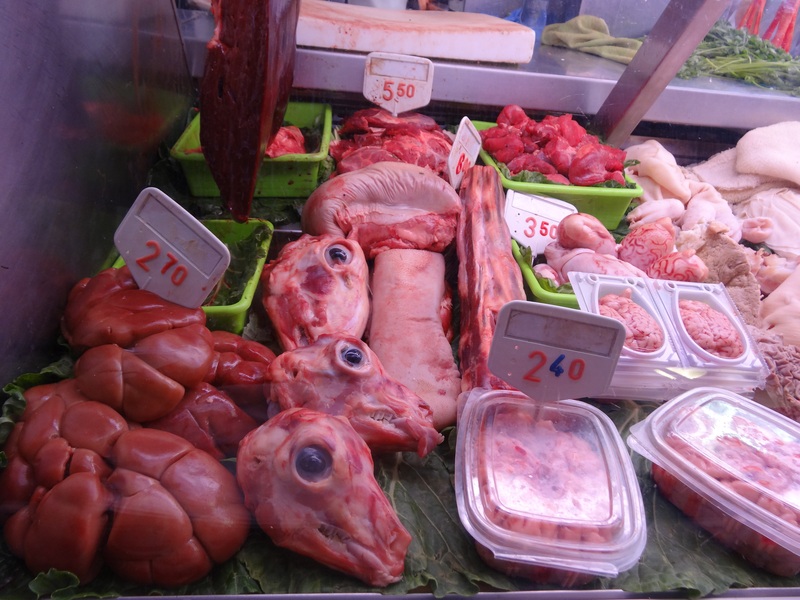 We saw one type of roast that wa 99€ a kg! Of course there were some ‘different ‘meats available. 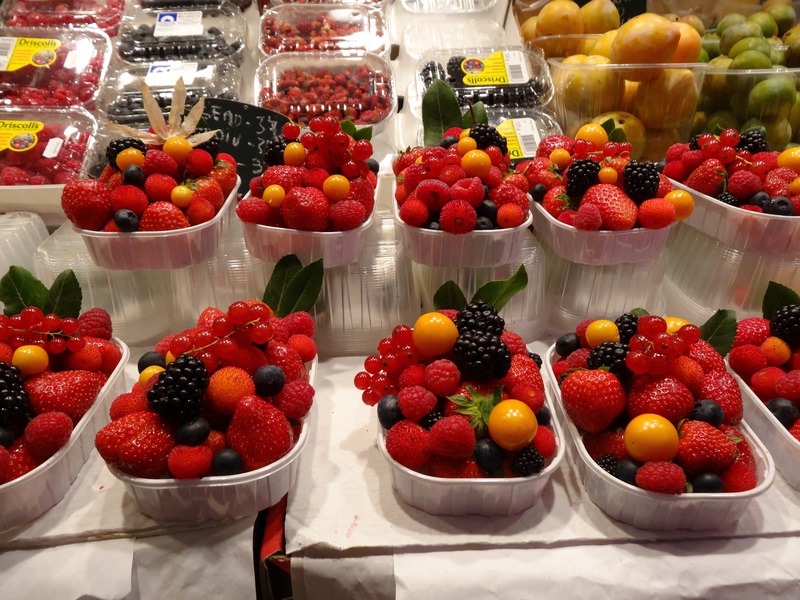 The fruits were spectacular and beautifully presented. 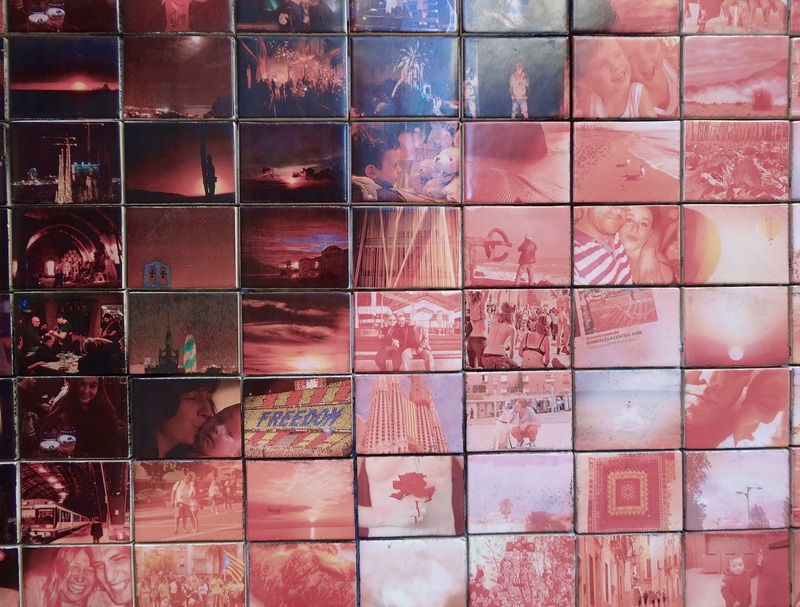 There were hundreds of these little photographed tiles that were assembled together to make a mural representing Moments of Freedom. 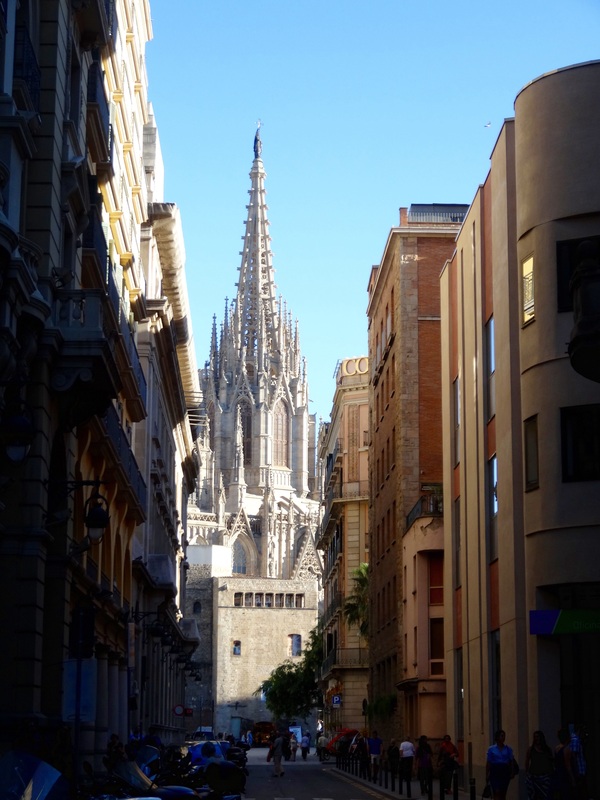 The sun lit up the steeple of the Barcelona Cathedral as we passed this street. Remember what I said about something to see every which way we look? 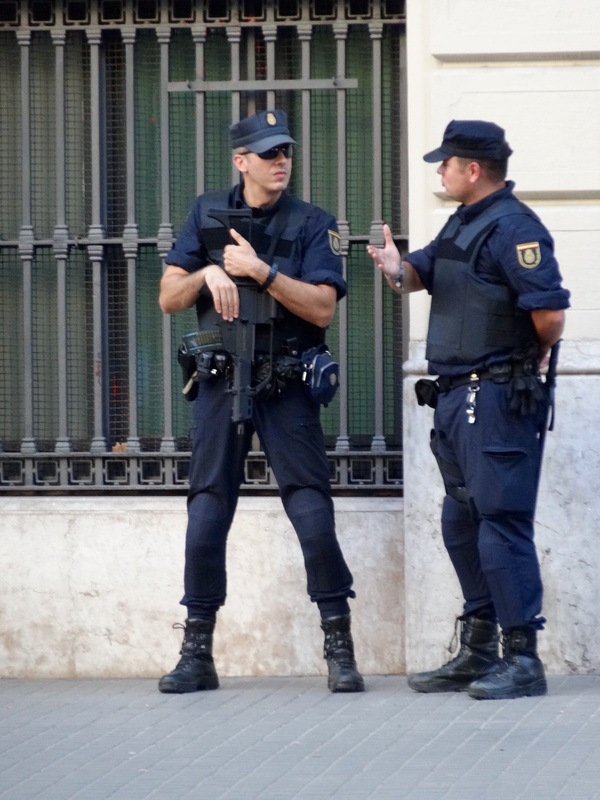 I asked these policia if i could take their photo and they said yes, but the one with the machine gun turned away so he wouldn’t be in the picture. That wouldn’t stop me from getting the photo I wanted, so I crossed the street, zoomed in, and took this photo instead. It is still strange to me to see machine gun toting police. We head back to the Life Drawing Meet Up location and after entering a very ordinary outer door this is what we saw! The Meet Up was up on the fifth floor, a beautiful big apartment turned into an art studio/office. I had a great time at a Life Drawing Meet Up last night. It was a session with a Pin Up Girl theme, and Ana, our model, was excellent, a true pin up girl! Here are a couple of my drawings. I felt a bit rusty as I haven’t been drawing for the last month or so, but it was a lot of fun and a good kick start to holiday drawing. 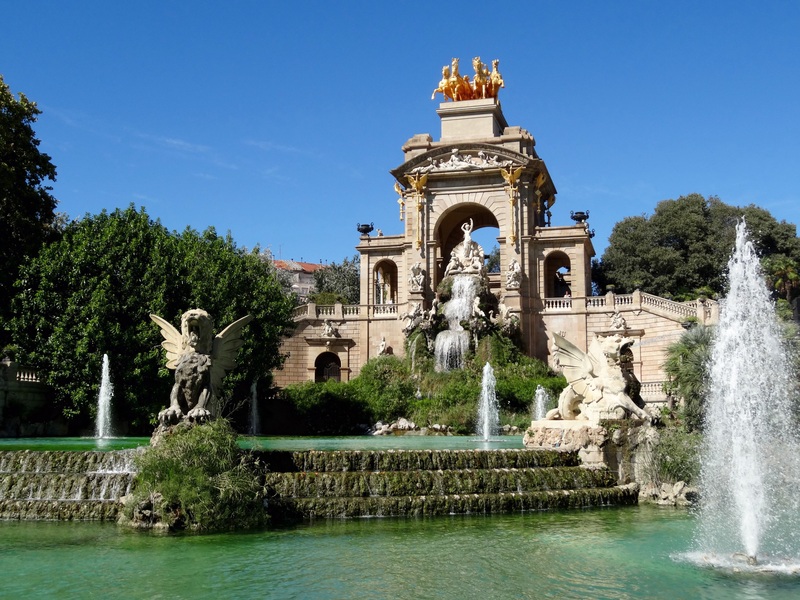 This entry was posted in Barcelona, Drawing, Historic Buildings, Life drawing, Parks and tagged Art, Barcelona, drawing, Parc de La Ciutadella by Trudy. Bookmark the permalink. Wow! I am loving travelling along with you!! Thanks so much for all the great pictures and I’m so happy you found a drawing class to go to……you don’t look very rusty to me!!! Yes, love to read about your travels everyday! 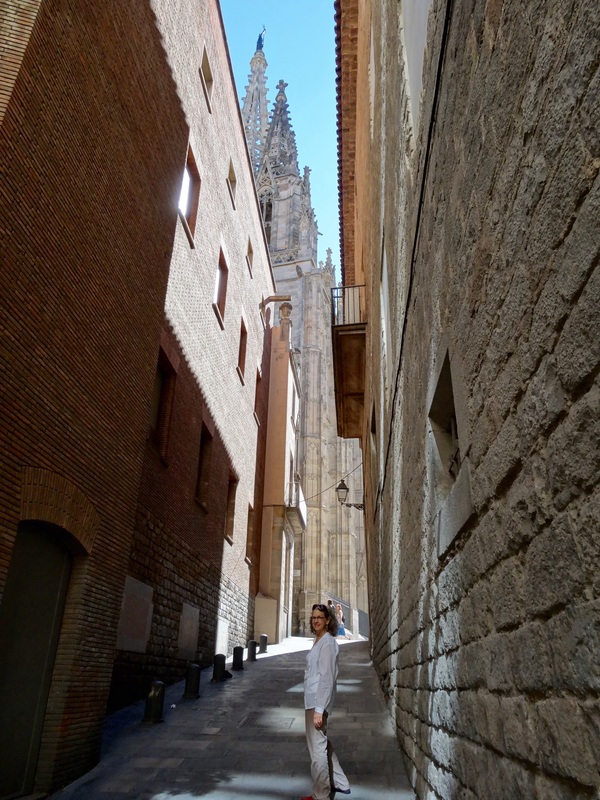 So many lovely things to see and do…take care! Thank you for the beautiful pictures Trudy. I almost feel like I am there with you! Your camera seems to be working beautifully so no need for a new one. Love, Carol.